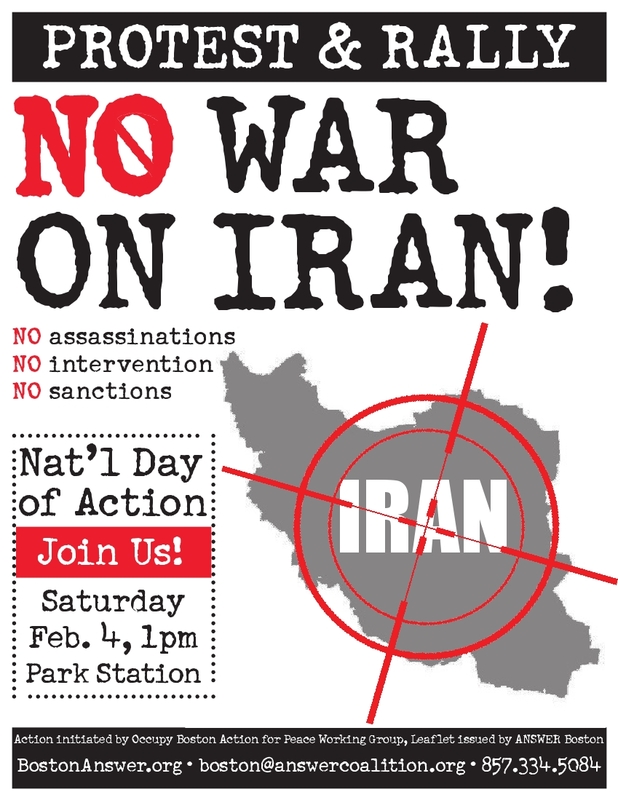 Sat., Feb. 4 National Day of Action: No Sanctions, No War Against Iran! The U.S.-led campaign to bring about regime change is escalating. The European Union announced a complete embargo of Iranian oil. Taken together with the other economic sanctions imposed by the U.S. and its allies, this is a campaign meant to impose maximum suffering on the people of Iran by destabilizing and destroying the country’s economy. At the same time, covert action inside the country, including assassinations, sabotage and drone over flights, is intensifying. U.S. military bases surround Iran, while nuclear-armed U.S. aircraft carriers and Trident submarines sit right off its cost. The pretext for this aggression against another country in the strategic Persian Gulf region is that Iran is developing nuclear weapons, an assertion that Iranian leaders have denied. The utter hypocrisy of this charge by the world’s leading nuclear weapons power and its nuclear-armed allies, including Israel, Britain and France, could not be clearer. Sixty years ago, the U.S. and British imposed a worldwide embargo on Iranian oil in response to the nationalization of the country’s petroleum resources by the Mossadegh government, the first democratically elected government in Iran’s history. The embargo weakened the government enough so that in 1953 the U.S. CIA was able to carry out a coup, and place the Shah (king) back on the throne. For the next 25 years, the Shah served a extremely brutal agent of the U.S., killing up to 100,000 Iranians in the regime’s notorious torture chambers, and turning the country’s resources over to U.S. oil companies and banks. Twenty-one years ago the U.S. pushed the UN Security Council a total blockade of Iraq. Thirteen years of sanctions killed more than a million Iraqis and severely weakened the country, paving the way for the 2003 invasion and an occupation which killed a million more Iraqis and killed and wounded tens of thousands of U.S. and other occupying troops. Now is the time to take action to stop the war that has already started against Iran before it escalates. Join us in Boston and around the country to demand: "No War on Iran! No Sanctions, No Intervention, No Assassinations." who explains that this is a "manufactured crisis"